(TibetanReview.net, Mar11’16) – The local Chinese government of Tibet Autonomous Region (TAR) is to spend 490 million yuan (US$ 75 million) over the next five years to repair and protect sites for the carrying out of the traditional Tibetan practice of sky burial, reported China’s official Xinhua news agency Mar 9. Although supposedly discouraged by the authorities, tourists from China are being allowed to watch the practice of feeding the dead to vultures on payment of a fee, as could be seen from a number of youtube postings. The report did not say, however, that the spending on the sky burial sites will be for tourism development purpose. The report said there were a total of 156 sky burial sites in the TAR which will receive funding. 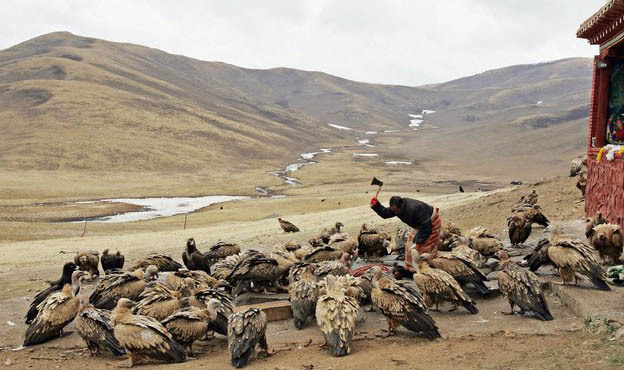 The regional government’s budget for this purpose for this year will be 165 million yuan and will cover 47 sky burial sites located mostly close to religious centres. It added that up to five million yuan will be spent on each site. The report cited Xu Jiali, deputy head of the TAR regional civil affairs department who had visited 60 sky burial sites during a preliminary investigation, as saying wild dogs, burial waste, bumpy roads and a lack of facilities for mourners were affecting the practice. He has added that the budgetary allocation will cover the cost of building roads, fences, reception rooms, mortuaries and furnaces to burn waste. The report said Pawo Samtenling Nunnery, built some 400 years ago in Qonggyai (Tibetan: Chonggay) County of Shannan (Tibetan: Lhokha) Prefecture, was among the first to be covered under the program. At least one, but sometimes up to four, bodies are said to be disposed off daily at this sky burial site.